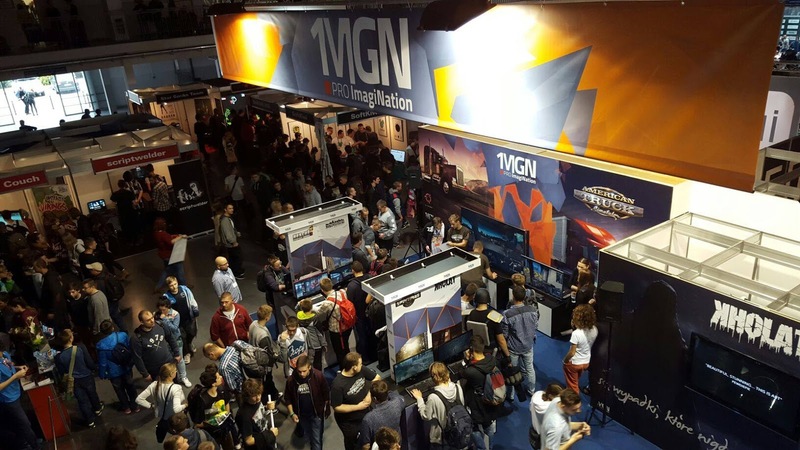 Last Friday we woke up in the middle of the night and drove over 500 kilometers to visit Poznań Game Arena - the biggest Polish gaming trade fair. Our publishing partner IMGN.PRO kindly organised a gorgeous pre-release presentation of American Truck Simulator at PGA, with a total six stands where the visitors were able to preview the game. Three of them were equipped with professional driving seats and high end Logitech steering wheels. All of that in order to give the thousands of visitors a chance to experience the driving in the best possible way. We were positively shocked by the attention paid to American Truck Simulator by the visitors and media, the booth was crowded non-stop. We had an opportunity to answer on microphone quite a few questions regarding topics which are frequently raised by the fan community. We are embedding and invite you to watch a couple of interviews given during PGA which have been already uploaded online. IMGN.PRO booth was also visited by several renowned YouTubers, including Wujek Bohun - the most recognizable Polish YouTuber focused on the simulator genre. Wujek was very kind to become the host of one of trailer parking competitions taking place in front of an 80-inch TV screen. Man, do you even potato? He's very intelligent,as you see.He and his polish army of haters can take hands and make ATS themselves. +Adrian Zgripcea I want to say only that you should calm down a little bit and hope that you didn't dare to play Multiplayer mod for ETS 2. Because that polish team made it "itself", when even SCS Software said that's impossible to make it with this engine. At least I do something,and not just complain here about what I want from SCS. "'m still curious how you guys get paid "
Don't missunderstand him, he is a huge fan of SCS's products, he bravely wrote a big amount of comments at each blog posts release, a single hater couldn't waste so many time on it !! Akula, you're a fake hater, I unmasked you ! Akula the hater,always pointing out the bad things instead of seeing the good things about SCS and how much they have done.They make the paint-jobs just to get money to make ATS and other future projects so if you want them to stop doing paint-jobs,then you have to say bye to ATS and develop the game yourself,which I think you have no idea how to. Akula, take your kurwa self off this blog, we don't need the negativity from you. Always a thorn in our side. Ehm... Nor I wanted to start a shitstorm against Akula, I'm sorry for you bruh. I'm respecting your opinion aswell as your need to point it out here. It just seemed a bit negative to me. Actually he said in the video they were hoping earlier but now they are pretty sure it won't be until early next year. Yay for Multiplayer in WoW!! Why SCS don't answer our question? Are there double trailers in this game? The moment they do mention and recognize double trailers is the day I can stop complaining, they really need to focus on that area. Please SCS give him this paintjob. He is asking for it since forever. WIP mods, Priwate mods / Offer Subscription - New WIP mods! finally steam workshop comes to ETS2 and its instant mod updates! So we're gonna have to wait a few more months for the game. Meh. As long as SCS keeps updating us with new information about the game I'm happy. Erm.... wouldn't it have made more sense to go the afternoon before and get a hotel room instead of getting up in the middle of the night and driving fatigued? Are you sure you should be programming a driving simulator??? LoL.... just busting your chops. Game looks brilliant; hope it's as enjoyable as ETS2. Wujek toś teraz pojechał, jesteś jeszcze bardziej sławny. Congrats for the interviews. Keep up the good work! Fantastic interviews. Congrats to Poznan show interviewers. Really good questions and a big thanks to SCS [Mr. Sobor] for the great insight and the answers. I for one, appreciate the honesty and clarity. I hope everyone repsects this also. Big news to me is the fact that ETS2 will continue to be supported. ATS looks like it will have a great future in parallel. Thank you for the insight to SCS once again. Same thoughts here. Well said, Jack. But please correct the grossest bugs in ETS2. 1) Trucks jam in mining in Scandinavia, even on concrete floors and flat surface. Loses grip in places obviously wrong. 2) 6x4 Trucks are impossible to drive. It was formerly the most stable configuration now is as if the vehicle was flexible, and the front wheels skid to turn a corner less than 15km / h. Completely useless, has no such guide. (Truck played: MAN 6x4). But that does not occur with 6x2 mobile axis. These work well. 3) Artificial intelligence is off? The traffic is suicidal. You do reduces to leave the car in the following preferred, then it also. It does then accelerates, and he reacts mirror shape and comes with everything up, causing collisions absurd. Trucks discontinued in range bound arrows and comes up if you are next door and it hits. Even using arrows and being the preferred, the traffic tends to provide collisions. Every time SCS posts something here, the idiots come out and post all kinds of drivel. If SCS could just figure out a way to make money from whiney posts they could be trillionaires in minutes. very bad news!people hoped that after three years have passed since the release of Euro truck simulator-2, we get finally in October a new game ATS!but...now we have to wait until next year?sorry! Concordo com os erros, mas a equipe da SCS vai corrigir.